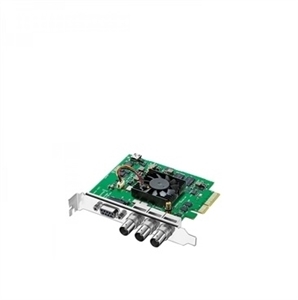 Adapter - PCIe 4L Slot to PCIe Cable Adapter - 3GBD SFP Optical Module Record uncompressed 10-bit video from SDI and HDMI video sources. DeckLink Mini Recorder switches between SD and HD video formats and is perfect for building ingest servers or other video solutions where you need to capture only in a low profile card! 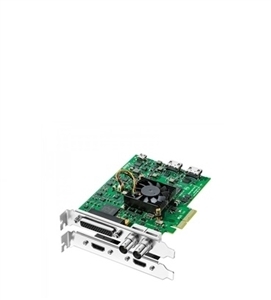 Includes two PCIe shields for both full height and low profile slots. Monitor uncompressed 10-bit video from your computer! Includes SDI and HDMI outputs for connecting to any television or monitor. DeckLink Mini Monitor auto switches between SD and HD so it handles all common video formats. DeckLink Mini Monitor is the perfect solution for monitoring from editing software while you edit! Includes two PCIe shields for both full height and low profile slots. Intensity Pro is a PCIe card for workstations. HDMI connections are built into the card and a breakout cable with RCA connectors is included for all your analog video and audio equipment. DeckLink SDI 4K is perfect when you need an SDI only solution but demand the highest quality SDI capture and playback. You get incredible quality 6G-SDI on any PCI Express Mac, Windows or Linux computer. DeckLink SDI 4K is the world’s smallest and most affordable multi rate SD/HD and Ultra HD SDI video card that lets you connect to any SD, HD-SDI, 2K and Ultra HD equipment. You also get RS422 deck control, internal keying and reference input for a complete solution for editing, paint, design and more. DeckLink Optical Fiber is the world’s first capture card to include optical fiber SDI connections. DeckLink Optical Fiber is identical to DeckLink SDI, but lowers the cost of using optical fiber SDI by building optical fiber directly into the card! If you work with a wide range of analog video and audio gear, and need to move seamlessly between SD, HD, 2K and Ultra HD, then DeckLink Studio 4K is perfect! DeckLink Studio 4K includes a massive number of analog and digital video connections including SD/HD/Ultra HD 6G-SDI, HDMI 1.4b, SD/HD component, composite, S-video, 4 ch balanced analog audio, 2 ch AES/EBU switchable to 6 ch out, black burst and tri-sync reference input, RS-422 deck control connections, keying in SD and a hardware down converter. Perform editing, paint and broadcast design and more with the ultimate future proof design! DeckLink 4K Pro is a high performance PCIe capture and playback card with advanced 12G-SDI for working with the latest high frame rate Ultra HD and DCI 4K formats at up to 60 frames per second! Ideal for both traditional 2D and high end 3D stereoscopic workflows, you get support for full resolution, deep color YUV and 12-bit RGB 4:4:4 images. DeckLink 4K Pro features two multi rate 12G-SDI inputs and outputs with support for 16 channels of embedded audio, along with a connection for reference input. Because the connections are multi rate, it works with virtually every SD, HD, Ultra HD and 4K format. DeckLink 4K Pro is perfect for high end film, television, and commercial editing, visual effects, and color grading projects. The world’s most compatible 10 bit video card that works in SD and HD! DeckLink Studio includes SDI, HDMI and analog video, analog and digital audio, keying in SD, a hardware down converter all in a compact and incredibly low cost solution that's perfect for broadcast editing, paint and design. The ideal solution for connecting to any camera, deck or monitor, all with the same card. DeckLink HD Extreme is the first DeckLink card to feature both SDI and analog I/O, and HDMI connections that instantly switch between high definition and standard definition video. DeckLink Quad is four independent SDI capture and playback cards in one! Includes four SDI inputs and four SDI outputs that can be independently switched between SD and HD video formats, as well as a common black burst/tri-sync input for all four channels. DeckLink Quad appears as four independent SDI cards to the computer, but only uses a single PCI Express slot. DeckLink Quad includes a built in watchdog timer under API control with bypass relays for a robust broadcast solution that automatically switches to bypass if power is lost, or software crashes. That's perfect for broadcast servers! Each SDI input and output can be a different video standard as they are all completely independent. DeckLink 4K Extreme features a high performance design for working in the highest film quality! Get 4 times the resolution of 1080 HD with full Ultra HD 4K capture and playback using 6G-SDI and HDMI 4K support. DeckLink 4K Extreme includes single and dual channel SDI connections for both regular 2D and 3D stereoscopic workflows as well as full resolution color RGB 4:4:4 capture and playback. Includes dual link 6G-SDI, HDMI 3D/4K and analog component, composite, S-video connections. Work in SD, HD and Ultra HD 4K. Also includes AES and analog balanced audio, 16 channel SDI audio, genlock, deck control, broadcast quality up, down and cross conversion, plus built in SD/HD internal keyer. The ultimate digital cinema capture card featuring two full frame DCI 4K inputs and outputs via 12G-SDI! You get dual link multi rate 12G-SDI connections that work with SD, HD and Ultra HD even in Ultra HD 60p, as well as full frame DCI 4K at 4096 x 2160 resolution up to 60p! Capture 10-bit YUV or full color bandwidth 12-bit RGB. Includes AES/EBU audio, up, down and cross conversion, plus built in 3D stereoscopic output at full bandwidth 4:4:4:4 RGB! No other capture and playback card supports more video formats and video connections! Multibridge is the world’s first external PCI Express capture and playback solution that instantly switches between SD, HD and 2K, in 4:2:2 or 4:4:4 video quality. 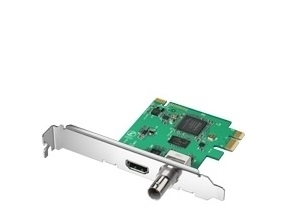 Connect to your PC or Mac with high speed 10 Gb/s PCI Express for the world's highest quality editing system, or use independently as a bi-directional SDI video converter.